I'm a big fan of song sacks, & have used them in many settings with young children. They've always been very popular & have been great to share with all ages, Minnie used to love them as a baby too! Basically, a 'song sack' is a bag filled with objects/toys that relate to different songs. Whenever I've used them there has been much excitement as the children eagerly guess what will be pulled from the bag! It's lovely to see their expressions as they delve into the song sack to collect an object. The children have then chosen a song which corresponds with the object, & we've sung the song together. Minnie & I love singing together, especially when it's bath time, but there are some days which feel longer than others, & by bath time my brain needs a little inspiration! So I came up with the idea of an Underwater Song Sack! 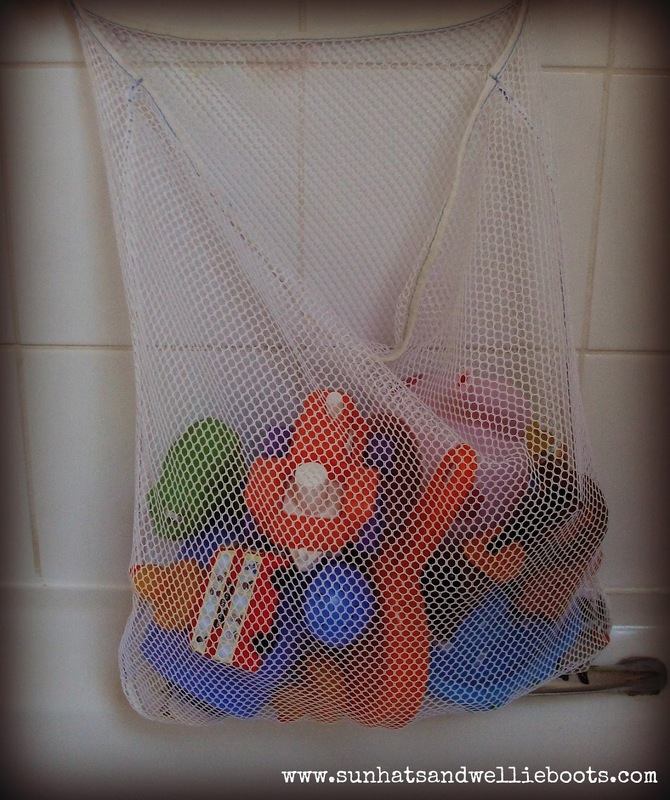 Instead of using a cloth bag we used a bath net & filled it with plastic items suitable for water play, with each one representing a song / Nursery Rhyme. * Five Little Seashells, Lying on the Shore. * The Cows on the Farm Go Moo, moo, moo. * Mix a Pancake, stir a pancake, pop it in a pan. 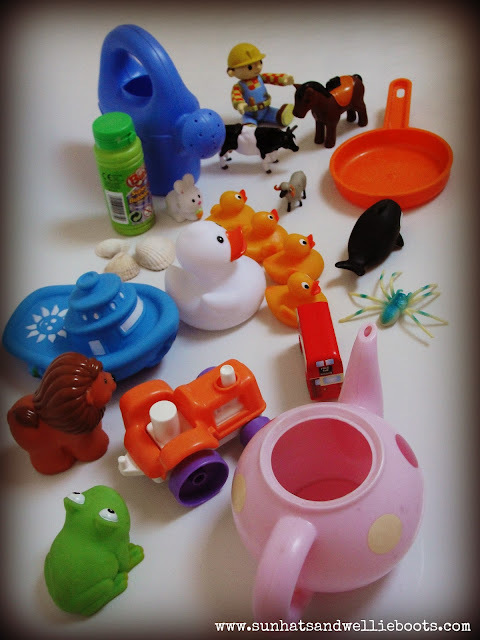 Bath time is a great time to share songs together in a relaxed space, with plenty of opportunity for fun, & splashing! This Song Sack is also ideal to explore outdoors in a paddling pool on a sunny day, or during any other water play, & of course the items from the song sack can spark plenty of imaginative play too. A few weeks ago we had Old McDonald sharing a cup of tea with five little speckled frogs!! 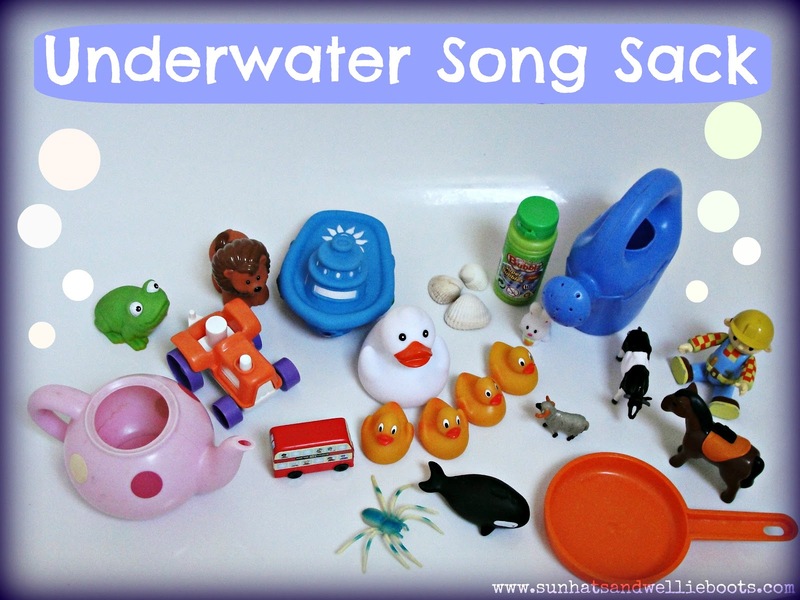 Any item can be used in an underwater song sack (as long as they're waterproof & safe) & items can be swapped or added so a wide range of songs can be explored. Do you share songs at bath time? What songs would you add to a song sack?